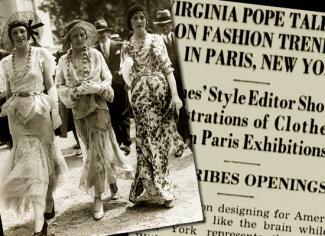 Until Virginia Pope of the New York Times made fashion the topic of serious newspaper coverage with the attendant responsibilities for accuracy, objectivity, and fairness, the words "fashion journalism" were an oxymoron. During her tenure at the Times (1925-1955), she raised the bar not only for fashion journalism, reporting on the Paris haute couture collections beginning in 1934 in addition to her regular New York coverage, she also introduced the idea of live theatrical fashion presentations, which she produced for the public each fall under the auspices of the Times. Many other U.S. papers of that era ran occasional photos of the latest Paris creations and counted on their society editors to report on who-wore-what to the local charity ball. There was little or no regard for the business of fashion, its sociological implications, or news from designers. In 1943, the New York fashion publicist Eleanor Lambert, who represented many New York designers of that era, initiated "press weeks," inviting fashion editors from newspapers throughout the country to attend capsule presentations of her clients' collections-showings that took place in New York hotel meeting rooms months after those same collections had opened to buyers in Seventh Avenue showrooms. Similar "press weeks" were held in Los Angeles, sponsored by the California Fashion Creators, a loose coalition of designers there. Lambert's press weeks continued, but more and more fashion editors from metropolitan newspapers began to attend the buyer openings and report, on the spot, from New York. And as they came, their competitors followed. A few-the New York Times, the New York Times Magazine, the New York Herald-Tribune, the Chicago Tribune, the Washington Post, the Boston Globe, the Chicago Sun-Times, and the Los Angeles Times-also reported on the Paris haute couture openings, as did the trade publication Women's Wear Daily. Eugenia Sheppard, then at the New York Herald-Tribune and later at the New York Post and Women's Wear Daily, was one of the first to make fashion writing entertaining. She also proved her resourcefulness as a journalist by once sneaking into a Balenciaga show as a buyer in order to get immediate coverage. (Balenciaga and Hubert de Givenchy showed one month after the other couturiers and put embargos on news coverage for a month after their openings.) Her coverage got her banned from the next season's show, but she managed to cover that one, and others from which she would eventually be barred, by interviewing buyers who were in attendance. Such ingenuity also made her one of the first to be a fashion journalist celebrity. By 1969, Paris ready-to-wear was becoming more and more important to American retailers, and newspaper fashion editors gradually started reporting on these twice-yearly events, later expanding that coverage to include Florence, Milan, and London. One editor, Nina Hyde of the Washington Post, made an exceptional contribution to fashion journalism by her efforts to discover new talent. Bill Cunningham, first a columnist for Women's Wear Daily and later a freelance contributor to the Chicago Tribune, Los Angeles Times, and Details magazine, was the first fashion photojournalist to point out design copying. His photos of original designs juxtaposed with his photos of the copies left readers of Details, the Los Angeles Times, and the Chicago Tribune with little doubt of the design's provenance, and his witty texts became classroom examples of how to make fashion writing interesting. Cunningham's photo essays of the New York fashion scene for the New York Times are a weekly documentary of what real people really wear on the streets and in the social arena. That so much fashion coverage in the 1970s, 1980s, and 1990s centered on the seasonal shows in Europe was a reflection of the Eurocentric nature of fashion at that time. The news-the trends that set the scene for the direction of fashion-was, for the most part, coming from Paris, Milan, or London. Americans were generally known as fashion marketers or stylists. Europeans, especially Paris designers, were the créateurs. As some have said: Americans make clothes; Europeans make fashion. Increasingly aware that a lot of the fashion space they usually garnered was being taken by the European coverage, New York designers began to join the trend to more theatrical shows by leaving their showrooms in favor of larger hotel venues. Many upgraded their presentations from models instructed to bring their own shoes and the announcing of style numbers to buyers seated in rented-for-the-day little gold chairs to choreographed shows with music, never-seen-before, never-worn-before accessories crafted especially for the collection, hair and makeup professionals creating beauty looks, backstage booze, and, eventually, "supermodels." In 1980, television fashion coverage, which until then had been limited to an occasional fashion "special," makeovers, and sixty seconds or so at the end of a morning show during collection openings, got its biggest boost when Elsa Klensch went on the air for CNN, her shows televised around the world. Given her international audience and her interviewing style-always respectful, never critical-Klensch was able to attract all the top designers for interviews and to gain access to their shows. For the first time, a viewer could watch the runway shows of all the major fashion players in New York, Tokyo, Paris, Milan, London, and Klensch's native Australia. Style with Elsa Klensch truly brought fashion to the masses. When the show was discontinued in 2000, it had an estimated 120 million viewers in 210 countries. Edie Raymond Locke's Show was another groundbreaking TV show from that time (1981-1986). The show was hosted by Edie Raymond Locke, who brought the magazine format she had pioneered as editor-in-chief of Mademoiselle magazine to USA Network. Her half-hour weekly shows concentrated on fashion, beauty, decorating, finances for women, makeovers, and model of the month. In the early 1990s, Geoffrey Beene became the first American designer to forsake the runway for the stage-first a mise-en-scène at Lincoln Center, then Broadway-type shows at the Equitable Building with elaborate stage sets, music created just for the show, and models interspersed with ballet dancers. By 1993 the Council of Fashion Designers of America (CFDA) decided to try to compete with the European cities as a fashion capital by creating 7th on Sixth (7th on Sixth was the CFDA's way of saying Seventh Avenue-typically known as Fashion Avenue-had moved over a block to Sixth Avenue where Bryant Park is located) and producing shows under tents in Bryant Park. As the showmanship increased, fashion coverage increased, and designers attracted movie and rock stars to sit front row, some exchanging clothes for appearances. Journalists from Europe and Japan attended, providing a global audience for New York designers, a few of whom had begun to sell to European stores and open their own boutiques there. Madonna became a regular. Barbra Streisand, Whitney Houston, David Bowie, Mariah Carey, Lenny Kravitz-all brought their star power to the tents, juicing the entertainment element and thereby increasing newspaper readership and television viewers. The Bryant Park shows inspired a television show, Full Frontal Fashion, which went on the air with New York's Metro Channel in 1998, featuring footage taken during the shows and designer interviews, many of them with the show's founder, Judy Licht. Producer John Filimon says the object of the show, which was being broadcast on the WE channel in the early 2000s, was, and is, to make the designer the star. 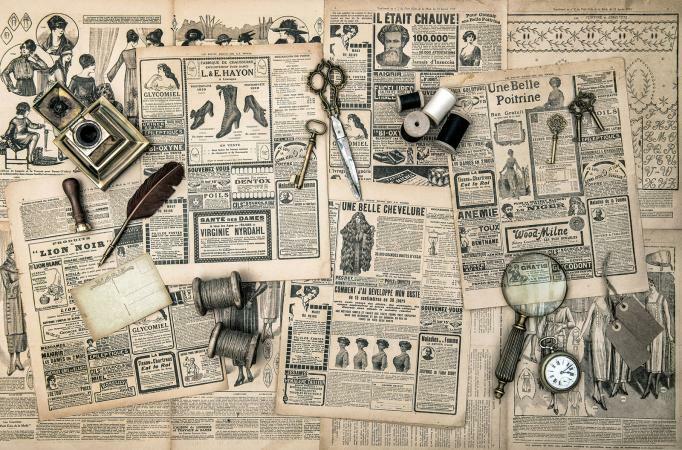 During the 1980s and 1990s, most newspaper fashion editors had a laissez-faire approach to their coverage, writing about trends rather than critiquing individual collections. The exceptions, notably Eugenia Sheppard, Hebe Dorsey of the International Herald Tribune and her replacement Suzy Menkes, and Amy Spindler and Cathy Horyn, the first and second fashion critics at the New York Times, treated (and treat) the subject of fashion, especially the openings, as critics covering other fields would do-with opinions as well as facts. The role of fashion journalism has obviously changed with the times. It also changes with the type of medium involved. Most magazine fashion editors do not write. They cover markets, making recommendations to the top editors for specific garments for specific shoots, and they style photography. The oldest fashion magazines, Vogue and Harper's Bazaar, have traditionally defined their fashion coverage not only by their audience demographics-upper-income adults-but also by their conviction that fashion begins in Europe and is homogenized in America. By encouraging American designers to "adapt" the designs of Cristóbal Balenciaga, Jacques Fath, and Christian Dior, for example, editors in the 1930s, 1940s, and 1950s discouraged design innovation in America, effectively relegating the New York designer to the backrooms of Seventh Avenue. And until the mid-1980s and 1990s, before it joined Paris, Milan, and London as a fashion capital, New York was generally considered a digester of fashion, not a feeder. The media effect of those two magazines, plus the editorial slant of Women's Wear Daily during the years John Fairchild was publisher, was to place Europe at the top of the fashion chain and to convince many American designers that their role was to assimilate, not innovate. In many respects, Fairchild revolutionized the way fashion was covered-with great irreverence. He and his staff mixed fact with opinion, encouraged controversy, baited designers, followed them, scared them, coined phrases ("the lunch bunch" was code for rich socialites), made some of them heroes and destroyed others. WWD, as it is known, even created a new syntax, using … as a way of separating thoughts instead of as an ellipse to indicate an omission. Like magazine fashion coverage, television fashion coverage is more subject-friendly than confrontational or critical. The entertainment element is fundamental. In many ways, the advent of television fashion coverage has influenced fashion in a way few predicted. As Malcolm McLaren was quoted as saying in the May 1995 issue of W Magazine: "Fashion is a television spectacle now. But at the same time, it has become voyeuristic. Because if people watch it enough, and read about it enough, to some extent they don't have to wear it. They've already consumed the idea." This raises the question: Is the widely circulated immediate coverage of the seasonal openings giving people too much advance knowledge of the season and thereby making the clothes look old by the time they reach the stores? The Internet's biggest impact on fashion journalism in the early twenty-first century is to enable users to see images of the collections here and abroad and read capsule reviews within hours after the runway show. For manufacturers inclined to copy, this is a great service. For designers eager to see what their competition is doing, it is far more valuable than an occasional photograph in a newspaper or trade publication. For consumers eager to see for themselves what lies ahead, and thereby help them plan their seasonal purchases, it is a boon. For someone hoping to see the season synthesized and trended, it is a boondoggle. For journalists who cover the shows and for stylists who will be responsible for accessorizing the clothes with the point of view of their magazine or their advertising client, it is a quick reference for planning future stories or avoiding the seasonal clichés. For magazine editors accustomed to making their own runway sketches as notes, it is a great backup. With the beginning of fashion on television, some, like McLaren, were concerned with its potential long-term impact on the subject. The same questions are being asked now about the Internet. Fashion can now be conveyed in a variety of ways, from print to live satellite feeds to video conferencing with designers. The question now remains: Why does a fashion journalist have to be there-wherever there is-to get the story? See also Fashion Advertising; Fashion Designer; Fashion Magazines; Fashion Models; Fashion Online; Fashion Shows; Fashion Television. Wood, Dana. "Modus McClaren." W (May 1995): 49.